At Maker Faire this weekend. tucked in between a building full of homegrown foodstuffs and a rock polishing booth is the Bay Area Garden Railway Society (BAGRS). They’re running a few live steam locomotives, and they’re beautiful works of engineering and modeling. None of these trains are electric; they all move by boiling water with either coal or butane. It’s a true, proper locomotive running on 45mm gauge track. [David Cole] of BAGRS gave me the walkthrough of their booth. It’s a simple oval track that took a solid day to level out. There are technically three sets of tracks, two G-scale, and another O scale sharing a rail with a G-scale track. Each and every one of these locomotives is powered by steam produced when water is heated by either coal or butane. Butane is the fuel of choice because of its ease of acquisition, but BAGRS had a few coal-fired locomotives with tiny shovels shoveling anthracite into tiny fireboxes. After loading up with water and getting the firebox nice and hot, these locomotives will cruise around the oval track for about half an hour, with the speed of the locomotive controlled by a servos and RC gear. Maker Faire isn’t the headline event for BAGRS; in July 2016 they’ll be hosting the National Garden Railway Convention in San Francisco. If you’re local to the Faire, it will be a cool event to check out. Flexiscale, the company that crowdsources and crowdfunds model kits, made a showing at the World Maker Faire. We’ve seen their work before, but this time we got to touch base with [Chris Thorpe] and get a handle on the future of user-requested model kits. Right now there are over one hundred proposals for what Flexiscale should do next. They’re mostly narrow gauge railroad locomotives and rolling stock, but [Chris] tells me they’re looking to branch out into larger projects including American locomotives as well as planes, ships, and buildings. This is a really, really cool project, and if you’re into models at all, you should at least be aware of what Flexiscale is trying to do. If you have an idea of what Flexiscale should do next, write up a proposal. I made one for the PRR GG1 electric locomotive, and if enough people support it, [Chris] will scan an engine and make a kit. [Mario] can take his train set on the road with him because he build the thing inside of a suitcase. That in itself is pretty neat, but he pulled off more than just laying down a ring of track and surrounding it with realistic scenery. This train set is automated. The suitcase itself looks a bit funny and that’s because it started as a portable phonograph. Removing the turntable and it’s requisite parts made plenty of room for the N-scale railroad (that’s really small stuff!). An Arduino with a motor shield drives the train around the loop. A reed sensor below a section of track provides feedback on where the locomotive is in the circuit. When it reaches that point the train stops and a bridge is lowered over the track for some invisible traffic to cross. There is even some audio flair which can be heard in the video after the break. It includes the whistle of the train and the ding of that bell mounted on the top half of the case. For reasons we can’t comprehend, model train layouts are incredibly popular in Germany. [Gerhard] is one of those model train aficionados that has moved far beyond a layout with a transformer controlling the speed of the train; he sent in a tip for a very tiny Rocrail server he built to control the locomotives moving across his layout. [Gerhard] uses Rocrail – a control system for train layouts large or small. Rocrail comes in both client and server configurations. The client is able to run on iDevices or Android. [Gerhard]’s server runs on a very tiny Linux computer tucked away under the layout. Instead of a Raspberry Pi ([Gehard] couldn’t get one in time for this build), he used a Carambola board. The Rocrail server is installed on this single board computer and connects to a CAN bus controller. It’s a step up from [Gehard]’s previous CAN/Ethernet gateway built around OpenWRT, and makes the entire device much smaller. [Gehard] doesn’t have a video of his layout in action, but after the break you can see how much the German people love their model trains at Miniatur Wunderland in Hamburg. [John Philip’s] brother has a sizable room set aside for his model railroad setup, and he was looking for something interesting to add to his brother’s collection. Rather than construct something for the railroad itself, he decided that an early 1900’s-style semaphore railroad signal would make a great novelty item for the room. The project started with [John] scouring the Internet for colored signal lenses. Once he found a set that worked for him, he crunched some numbers to ensure that the rest of the semaphore box stayed true to original scale. Inside the signal’s case you will find a small regulator board for his light source, an Arduino, and a motor controller board to actuate the arm. To ensure that the signal arm is always perfectly positioned, he installed a pair of reed switches on either side of the case, enabling the Arduino to auto-calibrate the signal’s position each time it is powered on. At first, this control scheme might strike you as a bit over the top, but we really like the fact that the signal can always configure itself to function perfectly, even if someone tinkers with/bumps into/moves the arm at any point. 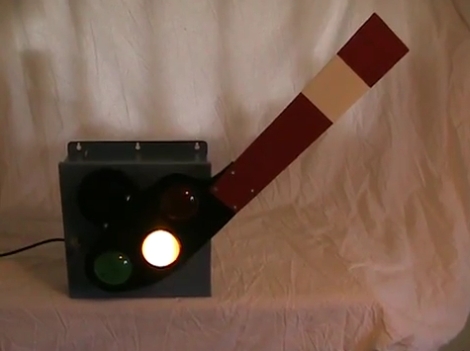 Be sure to stick around to see a short video of the semaphore signal in action. Justin liked Axiom: 100+kW Motor Controller. Justin liked 3D Printed X-Ray Machine. Justin liked X-Ray CT Scanner. René Arts liked USB-C-PD Soldering Pen for Weller RT Tips.